The increased complexity and variety of structures utilised in the insurance-linked securities (ILS) space during Q1 represents and market shift towards less standardization, as investors seek greater transactional diversification, according to Munich Re. 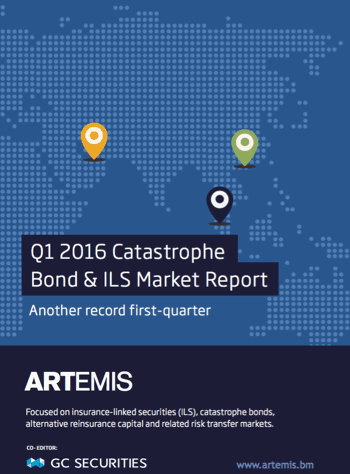 The record-breaking volume of catastrophe bond and ILS issuance seen in the first-quarter of 2016, as recorded by the Artemis Deal Directory, saw an increased use of more complex structures that included greater utilisation of aggregate coverage. “This development is proof of an overall shift in the market towards more complex coverage mechanisms and less standardization, in line with investors’ desire for more diversification and a higher variety in structures,” said Munich Re in its Q1 2016 ILS Market Update. 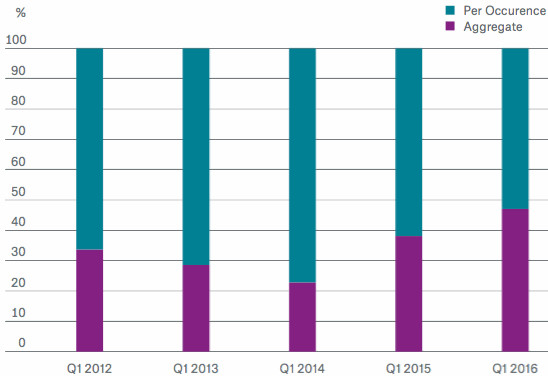 As highlighted by the above chart, which was provided by reinsurer Munich Re, aggregate coverage structures continue to fall behind per-occurrence protection, although during Q1 2016 it was almost an even split between the two features. According to data from Munich Re Q1 2016 was actually the only first-quarter of the last four years that saw aggregate coverage structures utilised on more than 40% of total ILS issuance, with per-occurrence protection remaining more favourable. As noted by the global reinsurance giant investor demands for increased diversification among ILS features and structures supported the growth of aggregate cover in the period. A trend that is supportive of the increased maturity and sophistication of both investors and sponsors in the ILS and cat bond space, which appear willing and able to participate in increasingly complex and diversifying structures that contributes to reduced market standardization, says Munich Re. “That said, less standardization in the market could impose challenges when estimating investors’ return requirements for new transactions. Variety in structures means fewer points of reference for pricing individual risk profiles,” says Munich Re. The result of this, explains Munich Re, is that ILS and catastrophe bond issuances in the first-quarter of this year witnessed more deviations in final pricing from initial price guidance, a trend that’s also highlighted in the Artemis Q1 2016 Catastrophe Bond & ILS Market Report. “While final pricing in previous quarters usually fell well within initial price guidance, the vast majority of issuance in Q1 2016 was priced at the upper or lower limit of the initial risk spread, with a few transactions priced even below initial guidance,” explained Munich Re. 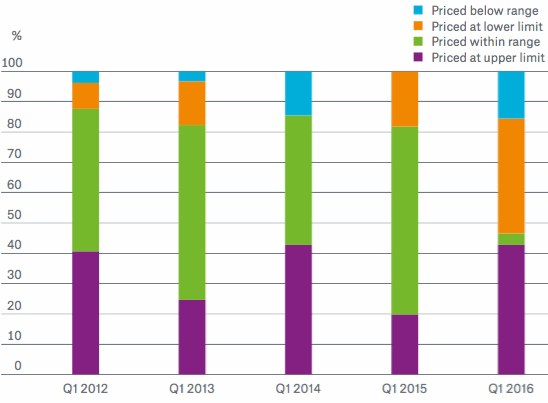 Data provided by Munich Re, and shown in the above chart, shows that when compared with first-quarter ILS and cat bond issuance in the four previous years, the majority of transactions issued in Q1 2016 priced at the upper or lower limit of initial price guidance. A deviation away from previous years that saw most cat bond and ILS Q1 issuance price well within the initial risk spread range. Investors are clearly becoming more and more comfortable with ILS and its varied structures and features. The fact that a growing number of sponsors and investors are successfully participating in increasingly diversifying and complex structures within the ILS space will only help to boost its acceptance as an asset class. That investors appear willing and more than capable of participating in a variety of ILS structures across a range of peril regions, utilising an expanding range of features, should also increase sponsor comfort within the space. 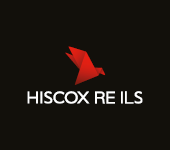 This could mean that sponsors feel increasingly comfortable with the capital markets investor base and are therefore more likely to return to a market that it knows can meet its capacity requirements and diversification demands, something that could also help to attract new sponsors to the space. The ILS and cat bond space increased its share of the overall reinsurance market during 2015, and with investors and sponsors both continuing to push for further diversification and market expansion, it will be interesting to see what the remainder of 2016 holds for the space, and whether it can continue down its impressive growth path. You can access Munich Re’s quarterly catastrophe bond and ILS market reviews here.